It is time to start homeschool posts again! I have to say this is one M really is enjoying! Our first homeschool review of the year is from Apologia Educational Ministries and is their Exploring Creation with Zoology 2: Swimming Creatures of the Fifth Day. 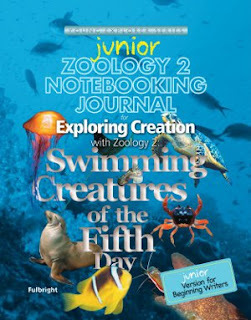 We received the Student Text Book ($39.00) and the Notebooking Journal ($24.00) and there is a Junior Notebooking Journal ($24.00) available. 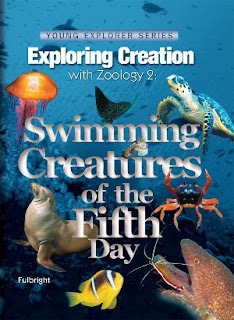 This is a great elementary science curriculum, recommended for K-6 grade. As a side note, we are presently in Florida, as most of my neighbors know, and we are hoping to see some of the aquatic creatures mentioned in this book. We generally spend some time at the shore to gather shells and such and a couple of years ago we managed to see a small group of whales from one of the piers. Back to Apologia, this course is set up in an easy to use manner. You may set the pace as to how much or how little you wish to do at a time. We like that after reading the assignment there is a "What Do You Remember?" section that allows the children to discuss what they have learned. You can then move on to the Notebooking Journal. This was my daughters favorite part as she was able to record things she learned, not only by writing it out, but by adding illustrations as well. She really enjoys drawing. The beginning of the book explains to you how to use this curriculum, along with providing a list of items to complete each lessons. Many of these items can be found around the home, but you will probably want to plan ahead, so you aren't missing anything, and so you don't spend 30 minutes running around gathering everything together. The last thing you do at the end of a lesson is the experiment. Some experiments are easy to complete, while others take a little more equipment and time. You can purchase science kits for some of these experiments. I also want to mention that I like the amount of photos and the quality of photos in the book. We enjoyed when the book arrived just taking a few minutes to glance through at some of the pictures. Now for the Notebooking Journal. We really enjoyed all the different activities in here. Some lessons we used the pick and choose method and skipped a couple of the activities based on our time. 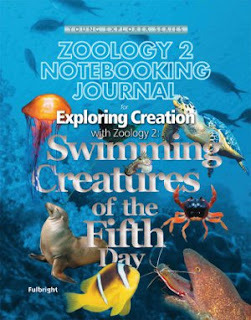 In the Notebooking Journal you will find Fascinating Facts, What Do you Remember Review Questions, Notebooking Assignments, Activities and Projects, Scripture Copywork, Vocabulary Crosswords, Project Pages, Cut and Fold Miniature Books (found in the back of the Journal), Dive Deeper, Field Trip Sheets, and a Final Review. My daughter enjoyed the Fascinating Facts as this was where she could record what she had learned and add artwork as well. I appreciated that the copywork is done in print and cursive. And she also likes the Vocabulary Crossword. Some of the projects include:Dissecting a frog or turtle, making a whale mobile, writing a story from the perspective of a starfish (this is right up her alley), and many other things. Is this a curriculum that I would recommend to my neighbors? YES! We both enjoy the Apologia Exploring Creation with Zoology. I have a feeling she will be wanting to try others in this series! Another quick note here, I love that it teaches from a Biblical viewpoint. I know that not all homeschoolers are Christian, but I LOVE when I find a series I can safely recommend to my close Christian friends. This is one of those series. 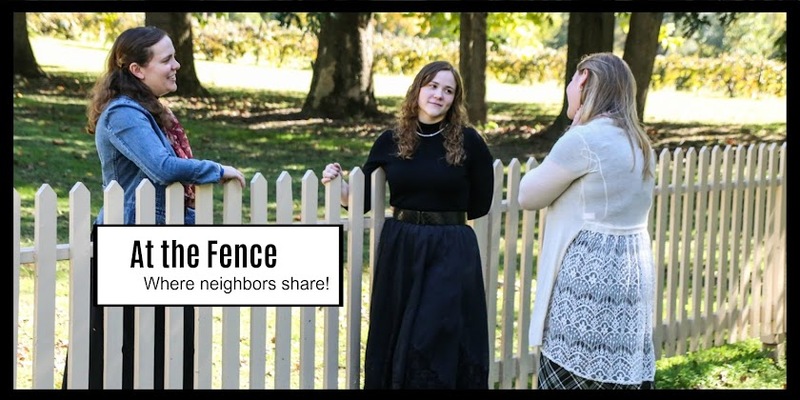 Be sure to click on the banner below to see what other Crew Members had to say about the Apologia Exploring Creation Series. Thanks for this review! So glad it was a blessing! Thanks for the review:) It looks like a great series!